IBEW 1245 member Dion Bailey has been elected to serve on the Hercules City Council. Photo by John Storey. Fourteen-year IBEW 1245 member Dion Bailey is no stranger to serving the public. 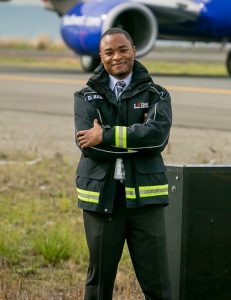 He’s made civil service his career, and currently works as an airport duty manager at the Port of Oakland. For the past five years, he’s also sat on the planning commission for the town of Hercules. And on Nov. 6, 2018, he was elected to serve as a member of the Hercules City Council. Bailey has lived in Hercules for 25 years, ever since his family moved out to the East Bay from San Francisco when he was still in high school. He clearly adores his city, and is brimming with new ideas to help improve it. One of his more ambitious goals involves the development of a rail station in Hercules. Serving on the City Council is a substantial time commitment, but it’s not a full-time job, so Bailey will be able to continue working at the Port and serving his co-workers as a union shop steward — but he will be required to vacate his seat on the planning commission now that he’s been elected to the City Council. Bailey believes that the years he’s spent as a shop steward have equipped him with a unique set of skills that enable him to be a forward-thinking elected official.